JIM VAIKNORAS/Staff photo Four new fire fighters in Groveland will be graduating Monday night from call/volunteer fire fighting training program run by the state. from the right Courtney Panaro, Alyssa Bosh, Jennifer Hicks, and Megan Shea. 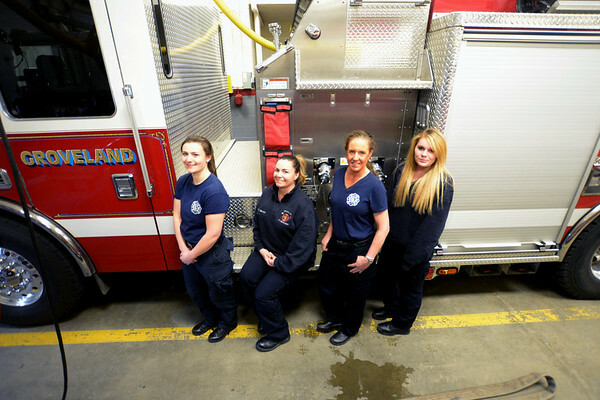 170304JVAfiremenJIM VAIKNORASStaff photo Four new firefighter in Groveland will be graduating Monday night from callvolunteer firefighting training program run by the state. from the right Courtney PanaroAlyssa BoshJennifer Hicksand Megan Shea.